Bread machines are ultra-convenient, but those towering loaves that are the hallmark of the bread machine can sometimes be unwelcome. 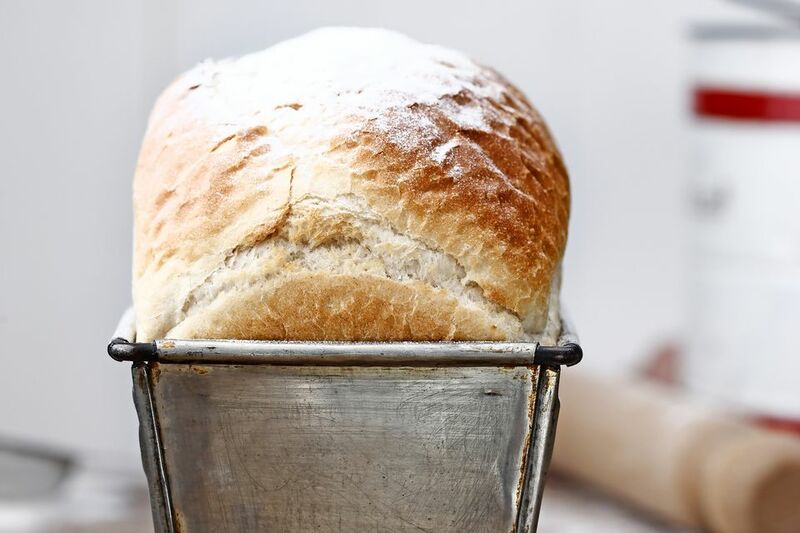 The easiest way to benefit from the ease of a bread machine but still have manageable loaves is oven baking your bread machine dough. Simply let your bread machine do most of the work for you, then transfer your dough to regular loaf pans and bake them in the oven. Follow these step by step instructions on oven baking bread machine dough. First, follow the bread-machine recipe for making a two-pound loaf (for two 9- by 6-inch loaves) or a 1 1/2 pound loaf (for two 8- by 5-inch loaves). Set the bread machine to the "dough only" setting. The machine will combine the ingredients, knead the dough and give it its first rise, then beep to indicate that the dough is ready to shape. If your machine doesn't have a "dough only" setting, you'll have to watch it carefully to see when the first rise is over and the dough gets punched down. Remove the dough from the machine and transfer it to a flour-dusted surface. Using a knife or a bench scraper, divide the dough in half. You can use a kitchen scale to ensure that the two pieces of dough are exactly even. Pat the dough into a rectangle, about 1/2 to 3/4 inch thick, in which the narrow sides of the rectangle are parallel to the edge of your counter. Starting with the "top" of the rectangle, the edge that's furthest from you, fold one-third of the dough over. Now, fold the bottom third of the dough up over the other folded piece, as if you were folding a letter. Turn the piece of dough 90 degrees, then repeat the folds, folding the top third of the dough down over the middle. Fold the bottom third of the dough over the center. You should now have a thick, square-ish piece of dough. Turn the dough over so that the seam is on the bottom, and tuck the layered sides underneath so the entire exposed surface of the dough is smooth. Place the dough in a pan that's been sprayed with cooking spray or coated with oil, and use your hands to flatten the dough a little towards the edges of the pan. The dough does not need to fill the entire bottom of the pan because it will expand to fill the pan as it rises. Repeat the shaping process with the other piece of dough. Then, cover both pans of dough with a dishtowel or a piece of plastic wrap that's been sprayed with cooking spray, and allow to rise in a warm space. The dough should rise for 45 minutes to an hour and a half, or until it is doubled in size. A good indication that it has risen enough is if the dough has risen a little past the top of the pan. Preheat your oven about 20 minutes before the bread will finish its rise. With a very sharp paring knife or a razor (or a lame, a special bread baking tool), quickly slash the dough lengthwise down the middle of the loaf, about 1/4 inch thick. 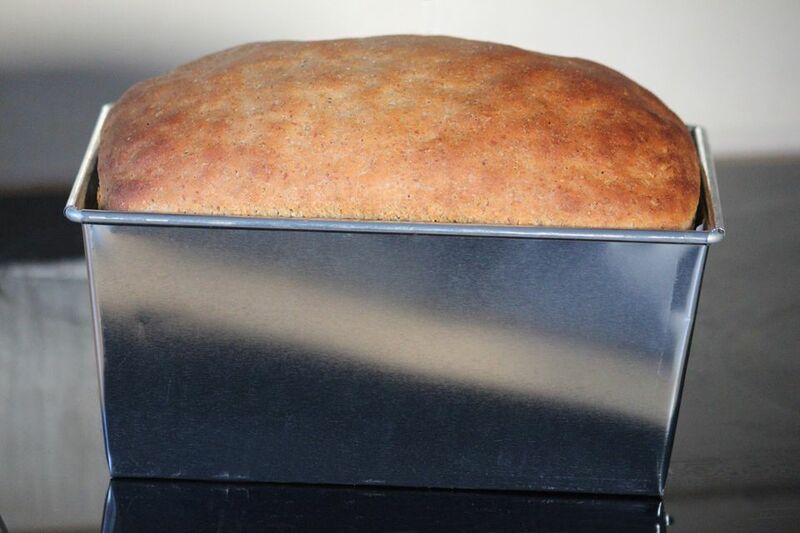 This will help the bread expand as it bakes, and will also give your bread a professional look. Place loaves in the preheated oven. The temperature depends on the types of bread; consult a bread cookbook to find the most similar type of bread to your recipe. Typically, doughs that are made with whole grains or large amounts of rich ingredients like butter or eggs will bake at 350 or 375 ​degrees Fahrenheit, while leaner doughs will bake at a higher temperature, 400 to 425 degrees Fahrenheit. The bread will probably take 30 to 45 minutes to bake; check it for doneness after 30 minutes. Bread will be done when its crust is firm and browned, and the underside of the loaf is also firm and makes a hollow sound when tapped. Remove the bread from the pan immediately and cool on a rack.